Once a person gets going with spreadsheets a use case that tends to pop up pretty quickly is the need to combine data from multiple spreadsheets for some kind of analysis. In this post I will share how to combine the arrayformula and importrange functions in Google Spreadsheets to make data from multiple spreadsheets more accessible. Lets imagine that I have two separate spreadsheets for recording evaluations for two separate classes of students in my school. 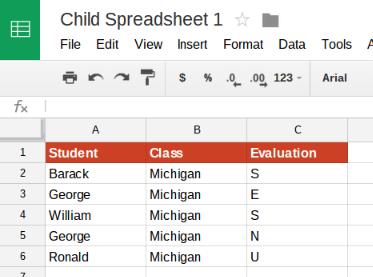 Child Spreadsheet 1 contains a list of six students, the class name, "Michigan", and each student's evaluation (E, S, N, U scale). 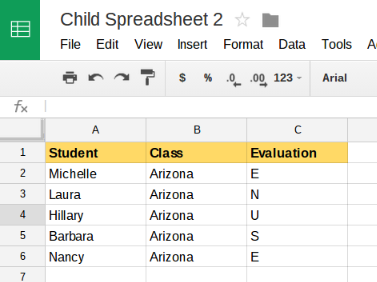 Child Spreadsheet 2 is the same, but contains the six students in class "Arizona". The question is how can I see both sets of class lists in one place, my Master Spreadsheet? The importrange function is like a wormhole connecting two points in space. With importrange the two points in space are two Google Spreadsheets and the connection is a one-way data pull. The importrange function expects two arguments, spreadsheet_key and range_string. The range string is the section of the spreadsheet from which to import. The format of the range string is not the standard string notation that one would use when typing out a formula in the formula bar. With importrange, sheet names with spaces do not have to be surrounded by single quotes. Instead, the format is the sheet name, an exclamation point, and the range all surrounded by quotation marks. To start with I'll just select "Sheet1!A1" as the range I am interested in importing. First, Google will require that I allow my master spreadsheet to access the child spreadsheet, which I can do by cursoring over the error message and then clicking "Allow access". The "Allow access" button along with the strange spreadsheet_key argument are two reasons that I start linking spreadsheets simply by pulling a single cell. Once one cell works, I know that I have the spreadsheet key and permissions set correctly and then I can move on to actually grabbing the data I'm interested in. Some folks will disagree with this approach, opting instead to start with the desired data range, but keeping it simple and building complexity out in steps is generally how I continue to approach spreadsheet work. It is important to point out that in this case I am using a bottomless range, Sheet1!A2:C, which means that I am going to import every row of the spreadsheet, even if additional rows are added to Sheet1 later on. In comparison, if I use the range Sheet1!A2:C6, I will get all the data, but future data added to row 7, 8, 9 etc. will not be included in the data pulled by importrange. There is definitely a time and place for finite ranges, but this is not one of them. Array result was not expanded because it would overwrite data in C2. Here importrange has decided not to display so as to avoid overwriting the change I made in cell C2. Child Spreadsheet 1 will remain unchanged. Next I construct a second importrange formula in cell A7 to bring in the data from Child Spreadsheet 2. The function is exactly the same is exactly the same as the formula I already wrote, except with a new spreadsheet key that points to Child Spreadsheet 2. The range I am interested in pulling remains the same. Notice that in the above example the original importrange function outputs an error to prevent it from overwriting the new importrange function. It is important to conceptually understand that even though the first importrange function contains only 6 rows of actual data, it also contains about 1000 rows of empty data because of the bottomless range in the second argument of the function. From the perspective of the Master Spreadsheet, these rows look like normal empty spreadsheet cells, but they actually contain the imported empty data from Child Spreadsheet 1. The arguments in the above array formula are ranges or a function that returns a result greater than one cell (e.g. importrange). Which will output two arrays stacked vertically, as shown below. However, the second range, class Arizona, shows up 1001 rows below. The reason that Arizona shows up on row 1001 goes back to the bottomless ranges I used in my importrange formulas. The importrange takes all of the cells in the given range, those with data and those that are empty. So as far as the Arrayformula is concerned, there is no difference between full and empty cells. It just sees two ranges, or lists, that are 1000 rows long each, and then stacks them vertically. The final output will be the two ranges of data that are being pulled from Child Spreadsheet 1 and Child Spreadsheet 2 stacked vertically and ordered by class. Remember, changes to the data in Child Spreadsheet 1 or Child Spreadsheet 2 will be almost instantly apparent in the Master Spreadsheet. The final output can be seen below.